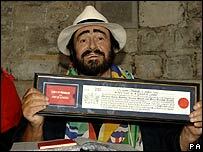 Italian tenor Luciano Pavarotti has received the freedom of the City of London at a ceremony in the capital. He was nominated for the award by the British Red Cross for his fundraising and humanitarian work for the organisation in the past 10 years. The ceremony was conducted at the Guildhall ahead of a gala dinner where Pavarotti was guest of honour. Pavarotti, 69, part of the renowned Three Tenors, is currently taking part in his farewell tour. The tour has taken him around the world to bid farewell to the many countries he has performed in during his career. No final date has yet been announced. As well as the freedom of the City, he also received a Red Cross Award for Services to Humanity. In 1995 the singer hosted a gala concert at the Royal Albert Hall which raised more than £350,000 for the charity. "We greatly value his support and commitment over the years to the humanitarian work of the Red Cross," said British Red Cross vice president Maria Shammas. "We are very pleased that he is able to be here in person to receive both the freedom of the City and the British Red Cross Award." The Freedom of the City of London is thought to have been first bestowed in 1237 and is one of the oldest surviving ceremonies of its kind. The award is given by the Corporation of London, which governs the "square mile" financial district in the centre of the capital.